2.5mm Ø, 7x7 stainless steel wire rope. Self-tensioning wall bracket end fitting. 1.5mm Allen key required for installation. 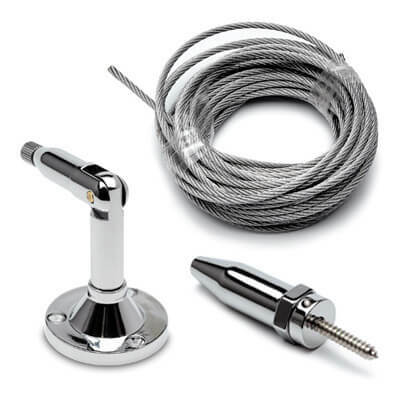 Screw fixings are required for wall bracket. Floor to Wall Mount ´Easy Fit´ Cable Display Kit. 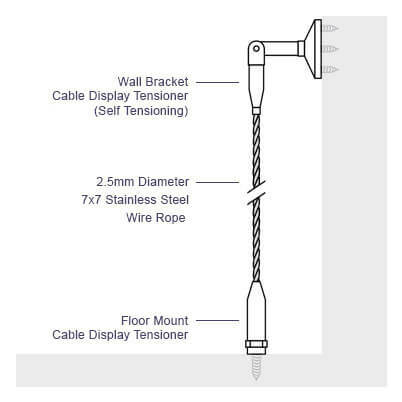 Complete suspended cable display kit with floor tensioner and self-tensioning wall bracket, supplied with stainless steel wire rope for you to trim to size. 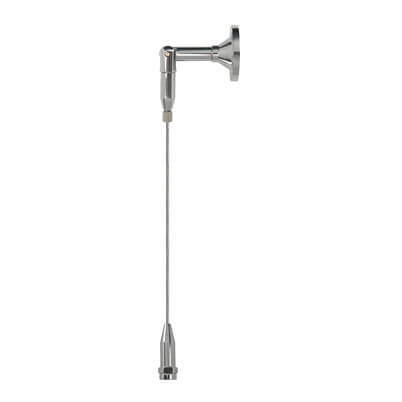 The wall bracket tensioner has an adjustable elbow, to allow for perfect positioning on angles and inclines. 3 x No.6 Countersunk Screws required for wall bracket installation. 1 x Floor Mount Tensioner. 1 x Wall Bracket Tensioner. 4 Metres of 2.5mm Diameter 7x7 Stainless Steel Wire Rope. Tensioners are suitable for direct installation onto wood, we would always recommend using a plastic/rawl plug for mounting on to other materials. Simply add horizontal and vertical supports for glass and acrylic from the ´Easy Fit´ cable display and wire hanging system. Always check that mounting surfaces are strong enough to take the weight of the items being displayed. No responsibility will be taken for incorrect loading. This responsibility rests with the installer. This cable display kit will only accept shelf and signage supports from the ´Easy Fit´ Cable Display range. Download and print our installation advice sheet for the Floor to wall mount Cable Display Kit. We recommend marking the position of the top tensioner first and using a plumb line to mark the position for the bottom tensioner. You can place shelf supports and connectors onto the wire rope before connecting both ends - supports can be adjusted to the correct position once the wire has been tensioned. 1. Use suitable no.6 countersunk screws to secure bracket base plate to mounting surface. 2. Unscrew the end fitting. 3. Press the end fitting towards the body and insert wire rope firmly until it locks in place. 4. To fully secure the wire, screw the end fitting back towards the main body. 1. Unscrew the main body from the threaded mounting block to reveal end stopper. 2. Secure the threaded mounting block in place with the screw provided. 3. Pass wire rope through body and end stopper, fix in place by tightening the grub screws using a 1.5mm allen key. 4. Replace main body onto the threaded mounting block. Stainless steel No.6 Pozi Countersunk Wood Screws. Single Shelf Support - Adjustable cable display clamp. Double Shelf Support - Adjustable cable display clamp. Single Shelf Support - Fixed position cable display clamp.